In May of 2008 I became the proud owner of 3 Gulf Coast ewes. Since then, I have learned a great deal about sheep and shepherding; I have had experience with at least 75 different sheep born or acquired on my farm, (no more than 30 at any given time) and many more as I have helped other shepherds and have become a sheep shearer of others’ small flocks. Now, I maintain a flock of about a dozen sheep, including registered Gulf Coasts, and a few Icelandics. I went looking intentionally to add Gulf Coasts to my hobby farm from the very beginning. I have to say, it is highly unusual for me to adopt a cause of any kind, even those with which I am greatly sympathetic. And the farm thing is a passion I never knew I had, nor expected. But that these Gulf Coast sheep are an overlooked, un-cherished American treasure is an issue that has taken hold of me and won’t let go. I suspect it is because there are just so many overlooked, un-cherished treasures in the world, it makes me identify with the cause of preserving the breed in ways that make it powerful for me. 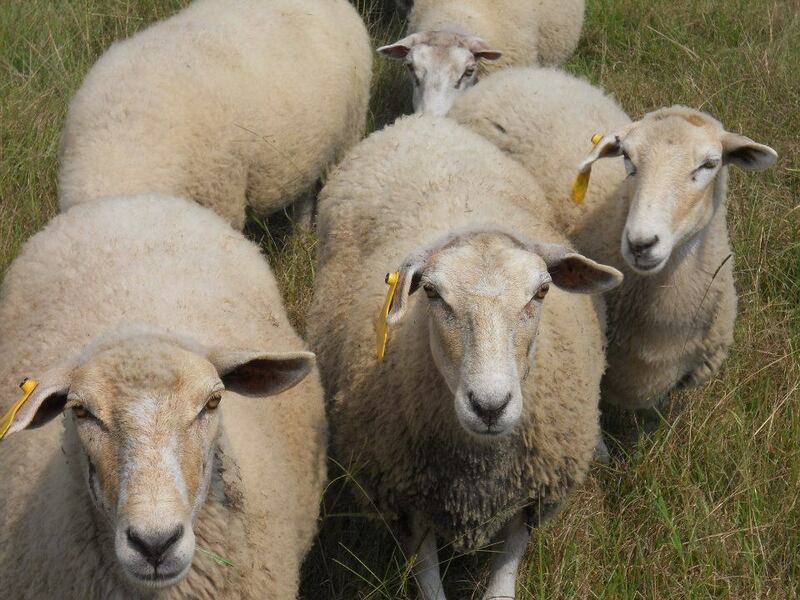 Gulf Coast sheep are also known as Louisiana Native sheep. They are the only sheep you could say are indigenous to our southeastern, coastal United States. They are descended from sheep Christopher Columbus and his men brought over from Spain. They use to drop off their Spanish sheep and goats on the little islands in the Caribbean so that on return trips they would have a fresh meat supply. These sheep were eventually brought to the southern US. Today’s Gulf Coast breed is descended from those that survived and adapted to the heat, parasites, and other conditions of our semi-tropical climate that are perilous to other sheep. Raising other sheep breeds here is impractical, if not impossible if they don’t also have super-impervious immune systems. As parasites have become so resistant to commercial, chemical de-wormers, having a naturally resistant breed is that much more important. Louisiana Natives (as I prefer to call them, to let people know there really are sheep that actually belong to Louisiana) are a dual purpose breed, being useful for both wool and meat. Louisiana Native sheep are one of the Heritage breeds on the critically endangered list of the American Livestock Breeds Conservancy. The ALBC is in the business of trying to educate people about restoring Heritage breeds of American livestock that are today endangered. These are the dual purpose breeds that for centuries before 1950, sustained not only the national American economy, but American families. Heritage breeds are those poultry and livestock that transported, worked for, fed, clothed and furnished our forefathers. A Heritage breed horse was used for battle, but was also the family car, truck, and plow. Mothers used wool from Heritage breed sheep to make blankets and clothes that kept their families warm, and products that when sold paid for shelter and education. Cows and goats gave meat, leather and milk. Pigs gave ham, bacon and leather. Leather from heritage breeds made clothing, tack for horses, furniture, book covers. Eggs and meat from Heritage breed turkeys, chickens or ducks were Sunday dinner. Feathers stuffed pillows, mattresses and other furniture. Heritage breed oxen, horses, donkey and mules provided the work that cultivated and harvested crops; cut and hauled the lumber and other goods that built the homes, barns, churches, schools, shops, banks and government buildings in the towns. Every aspect of American life was provided for either directly or indirectly by some American heritage breed poultry or livestock animal. Today we have Wal-Mart; yesterday we had Heritage breeds. Heritage breeds were practical for the family farm as they thrive with very little input. They can survive off the land on their own, with little or no extra feed. They are hardy, naturally healthy, naturally low maintenance, thrifty animals. Without them, America would have developed into a very different nation, if it could have developed at all. These breeds are endangered today, because of the shift into industrialized farming, and away from the family farm that began around the end of World War II. That is the time when “everyone who was anyone” left the Podunk farm and moved to the sophisticated, shinning big cities. In my opinion, this singular phenomenon had a greater impact on 20th century history and where we are today than any other. For one thing, before this shift, most families produced food to some degree, and/or at least ate food that had been produced near where they lived. The migration to the cities caused there to be a far greater number of people consuming food than were producing it. The farmers who were still in business came up with new ways to increase supply to feed lots of non-food-producing people who didn’t live nearby. Historically, there would be days at a time when the cities went without milk in the grocery stores, because there just weren’t enough dairy cows producing fast enough. This caused farmers to start breeding animals for maximum production and maximum profit at maximum speed. The heritage breeds are slower growing, which is no problem at all if they are sustaining a family farm, but impractical for large food industry. Industrial livestock breeding sacrificed genetics, rugged constitution, and quality for the sake of poorer quality, faster producing animals. Who cares about quality when they’re not going to live that long before slaughter anyway? Today a single dairy cow may be able to produce an enormous amount of milk in comparison to her early 20th century ancestor, but her genetics are such that she may also literally be unable to reproduce offspring after only 2 years! (The health value of our food has suffered horrifically in all of this as well, as has the treatment of industrialized livestock, but that is a matter for another day.) As people have abandoned the local, family farm, these amazing heritage breeds are now threatened with extinction. Some small scale hobby farmers are working to bring them back, and it is my own goal to contribute to this effort. But as far as I can tell, most participating in the organized effort seem to have very small flocks (I’ve yet to find someone who’s flock is over even 20) and I worry that it won’t be enough. After WWII, there were literally hundreds of thousands of Louisiana Native sheep grazing unimproved lands of the Southeast United States. Today, there are fewer than 2,000. Where it would be illegal to hunt, kill or eat an endangered exotic animal, such as a tiger or American Bald Eagle, it isn’t for endangered farm animals. I don’t have a problem with them being eaten; after all it is what they were intended for. Although it may sound backward at first glance, eating Gulf Coast sheep can actually create a market demand for them, which can end up saving the breed as more shepherds are consequently given incentive to raise them. Part of the responsibly managing a good breeding program is culling the sheep with less desirable traits. What is tragic to me is that this backbone of our basic, daily American heritage is so overlooked. While I am glad these sheep are still being used (even if for meat), by some, I wish more was being done to ensure the longevity of endangered Heritage breeds, like there is for dolphins, whales, seals, and jungle animals that live far away from our southeast, US region. It is at least illegal to harm other endangered animals, and it seems immoral to not protect to ensure the survival of a breed of which there are so few members. I realize it isn’t as though there are only 2,000 sheep of any kind left in the world. Even if Louisiana Native sheep do go extinct, other sheep will continue to exist. However, given the rarity of any breed of sheep that can not only survive, but thrive in our challenging climate, the magnitude of this potential loss should be seriously considered by all who live in this coastal region. If these Louisiana Native sheep do die out, and the few other, also endangered sheep breeds like them, it really will mean having no sheep at all that can survive in the coastal area of the southeastern United States: Louisiana, south Alabama, Georgia, Florida, and the particularly swampy parts of Texas. Heritage breeds still have a lot to offer to those returning to the family farm; customers of farmers’ markets; and American’s as a whole. Most people don’t know that in many places, it is perfectly legal to raise chickens in your suburban back yard. Fresh eggs and food made with them, have more flavor than any industrialized chicken can dream of. Where other sheep breeds succumb easily to parasites our wet Louisiana climate can’t get rid of, Louisiana Natives remain parasite resistant, needing little or no de-wormers. This makes them more cost efficient and their meat healthier. One Buckeye hen (also endangered) can find all of its food on its own, then fill up a family oven for Sunday dinner. One (or a few, depending on breed) dairy goat can give enough milk each day to sustain a family. Pediatricians are now prescribing goat milk for colicky, lactose intolerant babies. If these breeds are lost, we stand to lose a great deal more than just a nostalgic reminder of our own American history. We hope to find spinners and other customers who will value the novelty of working with wool from local, native sheep. I sell breeding stock to other shepherds who are interested in raising quality wool from Gulf Coast Native sheep, and in restoring the breed. I participate in public demonstrations of sheep and wool processing with friends at the Louisiana Renaissance Festival. These efforts give me some venue toward educating others about Louisiana Native sheep, and I hope, ultimately contribute to the preservation of the breed, and the hobby of creating yarn from raw wool. My husband and I have a small hobby farm in Florida and we are very interested in acquiring and raising a small flock of GC sheep to add to our farm. Do you have any contacts for breeders in Florida who may be willing to sell breeding stock? Try looking for the Gulf Coast Breeders Association on Facebook. They network very well, and will be able to help you find someone in your area. On Facebook, try searching “Gulf Coast Sheep” or “Gulf Coast Shepherd’s” and see what comes up. I have two heritage breeds of sheep: Jacobs (two-horned version) and Cheviot (original Scottish bloodline). I am interested in buying a GC ram. My sheep tolerate the climate of southern North Carolina but many are plagued by the barberpole worm. I would like to put a few young ewes of each breed in a pasture with the GC ram and watch their offspring for improved immunity. Most of my animals are registered but adding desirable genetic characteristics is more important to me than the pure blood paperwork. PS- My website is not operable at this time. Hi Steven! If you email me I can put you in touch with some good friends would would be happy to put you on their “potential buyer” list. They then let you know when they have stock for sale. I did not breed this year myself, & since I shear for them and am well acquainted with their bloodlines (their stock & mine are close relatives), plus I know them well as shepherds, I can highly recommend them. There might be GC closer to where you live, though. You can also try joining the Gulf Coast Breeders Association closed group on Facebook. If you friend me on FB I can try to help you get connected. Your idea about cross breeding is a thoughtful one. As I understand, all hybrids are more vigorous. But just so you know, I am aware LSU researchers tried this very thing for years. The result was always the same. First gen off spring very hardy & parasite resistant, but even breeding first gens to each other, the more they got away from the original half GC level 1 offspring, the more the parasite resistance evaporated. LSU tried & tried for years until they finally gave up & sold their flock. Not to say it is not worth doing. You are sure to still get really good sheep out of it, just not layers of generations that retain the original parasite resistance of those first 50/50 off spring. Dr Miller at LSU is one of the people familiar wth all that breed g research. You may be able to contact him thru LSU. Or maybe find some of his work published online. Worth looking into! Hello there! I just came across your site, looking for Gulf Coast Native Breeders. I am the director for a living history museum in Louisiana, and would love to give this breed a place to live in my park. Please feel free to email me, I’d love to talk about purchasing some livestock from you! I will contact you today. I sometimes demonstrate at the Rural Life Museum in Baton Rouge, and the Louisiana Renaissance Festival in Hammond. I would be happy to help you with sheep if I can! My goal too! But I am having challenges finding a competent sheer and more stock in Central Texas. Are you raising Gulf Coasts in TX? If so, are you on the breeders’ Facebook group, and/or the Yahoo group? Both are great places to connect with other breeders and find stock. I have heard of several in TX. As far as shearing goes, I can point you in a few directions to help you get started learning to shear for yourself if you are interested. Just ask! Happy to help.